This simple Do-It-Yourself project, which will probably cost you no more than £10, will enable you to improve the clarity of reception on medium-wave radio stations to an unbelievable level. 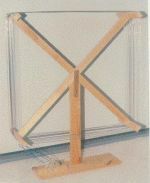 NOTE: This graphic of the tuned loop antenna is slightly different from the one described here in the building instructions, in that it has a central leg on which to stand, this is only a cosmetic feature and is not necessary to the better reception of a radio signal. The results of these amazing antennas really and truly has to be heard to be believed. So how do I build one? I hear you ask impatiently. I'll keep you in suspense for a few minutes, firstly I'll explain a little of the background of the tuned loop antenna. What is a Tuned Loop Antenna? The loop antenna is designed primarily for the AM band, which utilises the 530 khz to 1620 khz section of the radio spectrum. Indeed there are two different types of loop antennas, The first of these is the ferrite bar as build into practically every portable radio, the other is wound on an air-core form, and is far less popular with radio manufacturers because of its size, this is known as a tuned loop antenna. A loop antenna is very directional. The pickup pattern is shaped like a figure eight. The loop will allow signals on opposite sides to be received, while off the sides of the loop the signal will decrease or be nulled out. The nulling feature will allow you to remove a local station on a frequency and pick up another on the same frequency by removing the local signal. For example, I could be listening to Magic 1548 from Liverpool on 1548 khz from my home in Ireland, also on that same frequency I can faintly pick up some music and chat from another radio station on the same frequency, so I turn the loop antenna around slightly in the general direction of this other radio station and as if by magic, I can now hear a very clear signal from this other station which turns out to be BBC Radio Bristol, at the same time the signal from Magic 1548 has faded somewhat into the background mush. Air core loop antennas come in many sizes. The larger the loop the more gain there is. A smaller loop will actually lose part of the signal. There are two ways a loop can be wound, box or spiral. In the box or solenoid loop the plane of the windings are wound perpendicular to the diameter of the loop, so each loop is the same size. In the spiral loop the plane of the windings are wound parallel with the diameter of the loop, so each loop gets smaller as you wind into the centre of the loop. A loop needs to be able to rotate to null out a station. And a loop also needs to be able to tilt from vertical. This also helps in in nulling of a signal (alt-azimuth feature). One way is not connecting it at all, this requires a portable radio with a internal loop antenna in the form of a ferrite rod. The field of the loop will radiate the peaked signal and you will be able to pick it up with no connection to the radio. You can move the radio around to get the best reception. The second way is to get a direct coupling to the loop which is used as a pick-up coil, This consists of one turn of wire wound around the circumference of the loop, this is then connected to the radio's antenna socket by means of a removable flying lead. The antenna consists of an LC (tuning) circuit formed by the air-core loop and a tuning capacitor. High-frequent magnetic fields induce currents in the loop, and these are (passively) amplified by the resonance of the LC circuit for the frequency to which the circuit is tuned. The reaction is maximal if the field lines flow through the core, that is, the axis of the core is perpendicular to the direction of the transmitter, and minimal if the axis points in the transmitter direction. The energy can be guided into your receiver in several ways. (1) If you use a portable radio with built-in ferrite rod, just place it inside or near the loop. (2) You can add a pickup coil, consisting of several windings isolated from the primary coil, and connect it to the antenna/ground input of your receiver. The antenna improves reception of weak or interfered stations in several ways. Radio signals consist of electric and magnetic waves, and while a longwire or dipole reacts to electric fields, the loop reacts to magnetic fields. Because interference of atmosphere or applications is electric, it is ignored by the loop. The loop is quite directional, and you can pull in a remote station A that is overshouted by a closer or stronger station B (on the same or an adjacent channel) by nulling out B. The tuning circuit is sufficiently selective to ensure that the resonance is appreciably stronger for the chosen frequency than it is for adjacent channels; this is a great help in reducing Adjacent Channel Interference (ACI). First of all cut two pieces of 2 inch X 1 inch timber, each piece measuring 25 inches long. Half along each of these legs cut a piece out of the legs exactly the size of the other leg, so that the two legs can be screwed together in the form of an X. Then cut 4 pieces of timber 6 inches long, these are screwed on the end of each leg to form feet, the primary wire coil is also wound around these four feet. Firmly fix in place one end of the 120 foot length of wire to the centre of the frame, where the two legs cross, feed the wire to the end of one of the legs, and wind it around the four feet for 18 turns, then feed the remaining wire back to the centre of the frame using the same leg as where the wire began, this is most important, both ends of the wire must go from the winding coil to the frame centre along the same leg. Affix a tuning capacitor salvaged from an old radio to the centre of the frame, where the two legs cross, using glue or whatever, I use two small nails hammered into the legs, so positioned to hold the tuning capacitor in place. Then cut the wire ends to make a neat connection to the tags on the tuning capacitor and solder the wires in place. By now you should have a fully working loop antenna, ready and waiting to serve up the world on your radio.